Watch an exclusive SNEAK PEEK from the premiere of an all new season of THE GRAHAM NORTON SHOW before the U.S. Premiere *** Saturday Oct 27 at 11pm/10c *** With must-see guests: ARNOLD SCHWARZENEGGER, USHER, actress-comedian MIRANDA HART (Call The Midwife) and comedian Ronnie Corbett. ARNOLD SCHWARZENEGGER's got dozens of insta-classic catchphrases from his classic blockbuster movies. But they're not all destined to be hits. Here, get the inside story behind TERMINATOR's "I'll be back" - and find out ARNOLD's suggested original rewrite... that didn't quite hit the mark! 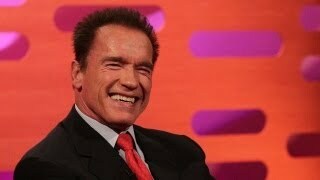 Arnold Schwarzenegger On The Graham Norton Show Full Interview (19-10-12) ... Arnold Schwarzenegger: Women Can Weightlift to Get Fit, Part 1 Johnny Carson.